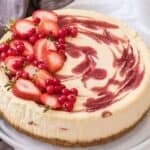 Beautiful strawberry swirl cheesecake is an easy dessert recipe made with simple homemade strawberry sauce and smooth, creamy baked cheesecake. Strawberry swirl cheesecake is easy to make at home, pinky promise! It will be an absolute hit at your next family supper. Plus, it uses simple, everyday ingredients! What is the difference between strawberry cheesecake and strawberry swirl cheesecake? 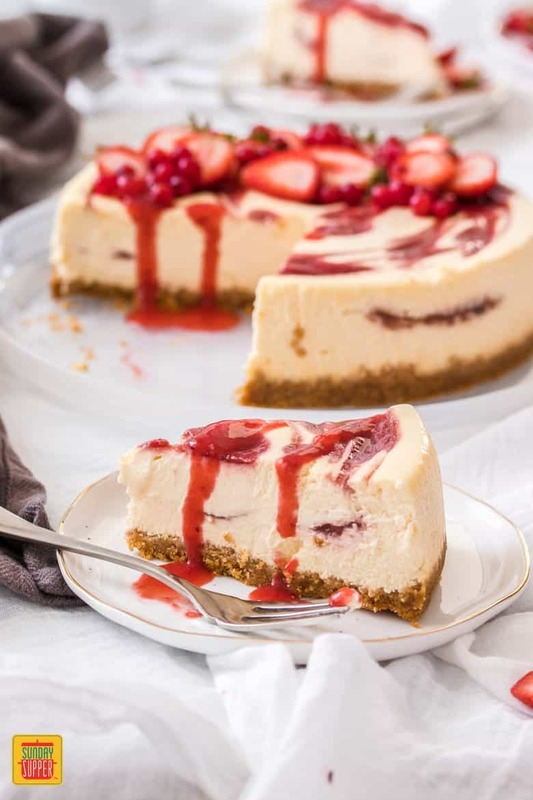 A strawberry cheesecake can be many things, from having strawberry puree mixed right through, to simply being topped with fresh strawberries and a strawberry sauce. 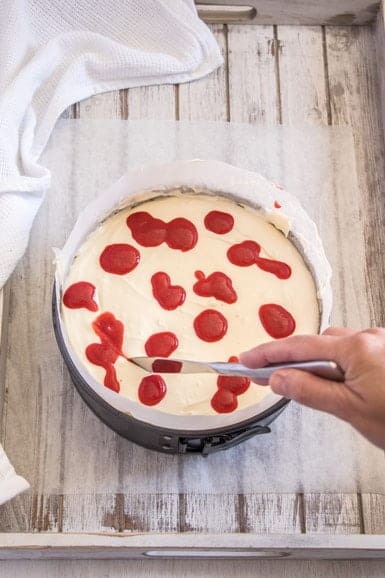 What sets strawberry swirl cheesecake apart from plain strawberry cheesecake are the swirls of fresh strawberry sauce running through the middle and around the top, creating a beautiful pattern. This baked cheesecake recipe is a classic dessert you’ll love! What ingredients do you need to make cheesecake? It is so simple to make strawberry swirl cheesecake at home. 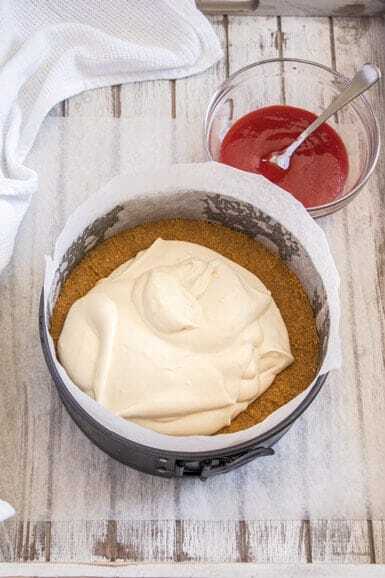 The cheesecake mixture itself is simple to mix together in a stand mixer, or even with a handheld beater. Preheat the oven to 325°F. Grease and line the base and sides of an 8-inch round springform tin with baking paper. Use a food processor to process the crackers to fine crumbs. Add the cinnamon and ginger and pulse to combine (TIP: if you don’t have a food processor or blender, put the biscuits in a bag and crush them with a rolling pin). 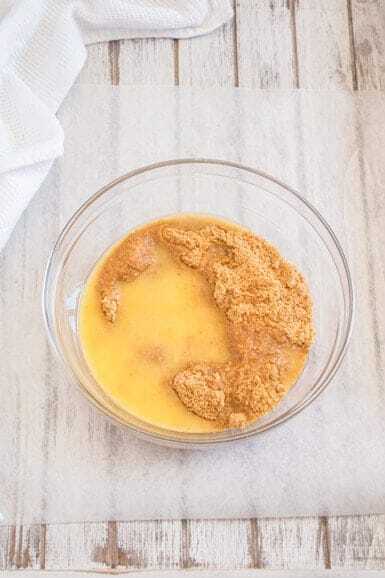 Tip the crumbs into a bowl, then mix through the melted butter. Press firmly into the bottom of the prepared tin. Bake for 10 minutes, then set aside while you make the filling. Using a stand mixer with the paddle attachment, beat the cream cheese on low-med speed for about 2 minutes until smooth and creamy. Scrape down the sides of the bowl as required. Add the sugar and vanilla and beat well. Again, scrape down the sides as necessary. Add the eggs and extra yolk one at a time, beating until each is well incorporated. Add the sour cream, salt, lemon juice, and zest, and beat well. The mixture should now be looking completely smooth and glossy. Pour half of the cheesecake mixture over the base. See below for instructions on adding the strawberry swirl. Bake for 45-50 minutes on the middle shelf of the oven. There should be a slight wobble in the center. Turn the oven off and allow the cheesecake to cool in the oven for half an hour with the door closed. 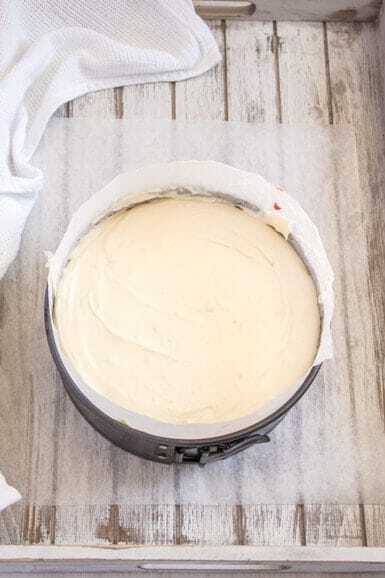 Remove the strawberry swirl cheesecake from the oven and let it cool for at least 45 minutes at room temperature before covering (a plate over the top of the tin is fine) and placing in the fridge to set completely. Let it set for at least 4 hours. 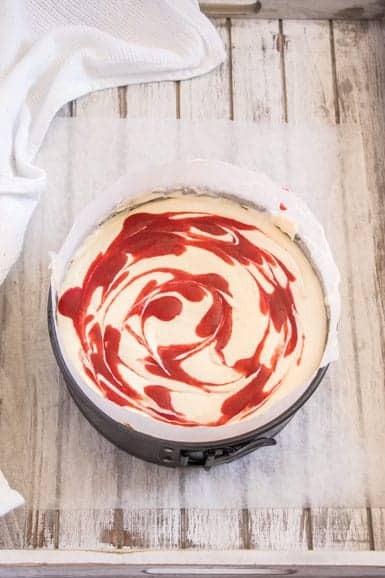 How do you make strawberry swirls in cheesecake? Creating the beautiful strawberry swirls in strawberry swirl cheesecake is easy. With a teaspoon, dollop about half the strawberry sauce in small blobs over the top of the cheesecake. Carefully spoon over the remaining cheesecake mixture. Smooth out the top just a little, then again use a teaspoon to dollop over the remaining strawberry sauce. Drag a knife through the little strawberry patches to give it a swirl effect. 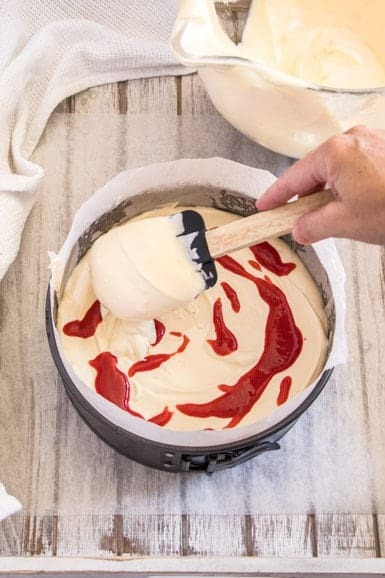 What I love most about this strawberry swirl cheesecake recipe is that there are no fancy steps (no bain-marie or water bath). The cheesecake goes straight into a moderate oven and bakes for 45 minutes or until there is just a slight wobble in the center. RECIPE TIP: A great tip to stop a cheesecake from cracking is to allow it cool slowly. You do this by letting it cool in the oven for half an hour after it has been turned off. Then, remove it from the oven and let it come to room temperature before covering the top and placing it in the fridge to cool completely. How long will cheesecake keep? Strawberry swirl cheesecake will keep well in the fridge for 4-5 days, so take your time and enjoy eating it for dessert every day. Yes, you can freeze cheesecake, although, from personal experience, there’s rarely enough left in my house to do it! 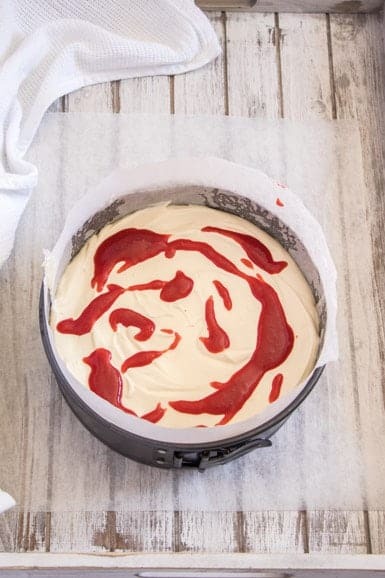 Just set the strawberry swirl cheesecake on a flat plate or the baking tin base and wrap it 2-3 times in plastic wrap so that it’s very well sealed. Freeze it for up to a month. Make sure to thaw it in the fridge, and if you’re thawing the whole cake, give it at least 24 hours to make sure it’s perfectly thawed. 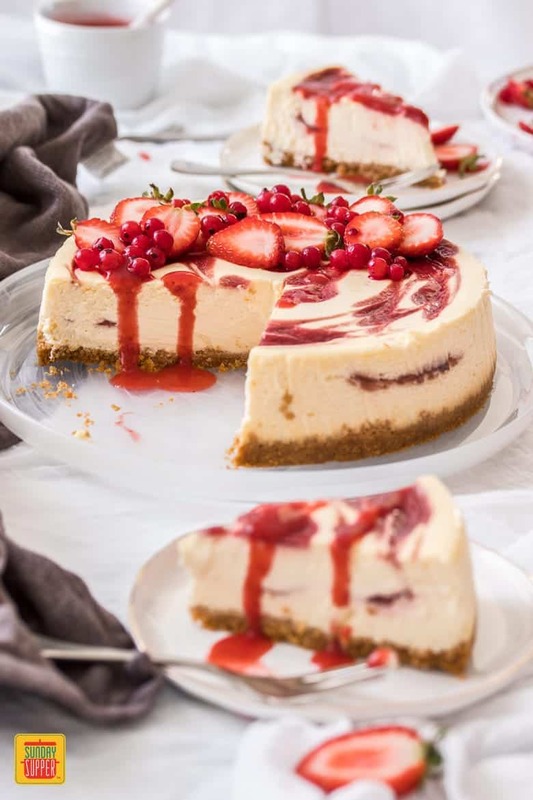 For a really impressive, creamy and delicious cheesecake using simple ingredients, this strawberry swirl cheesecake takes the cake! 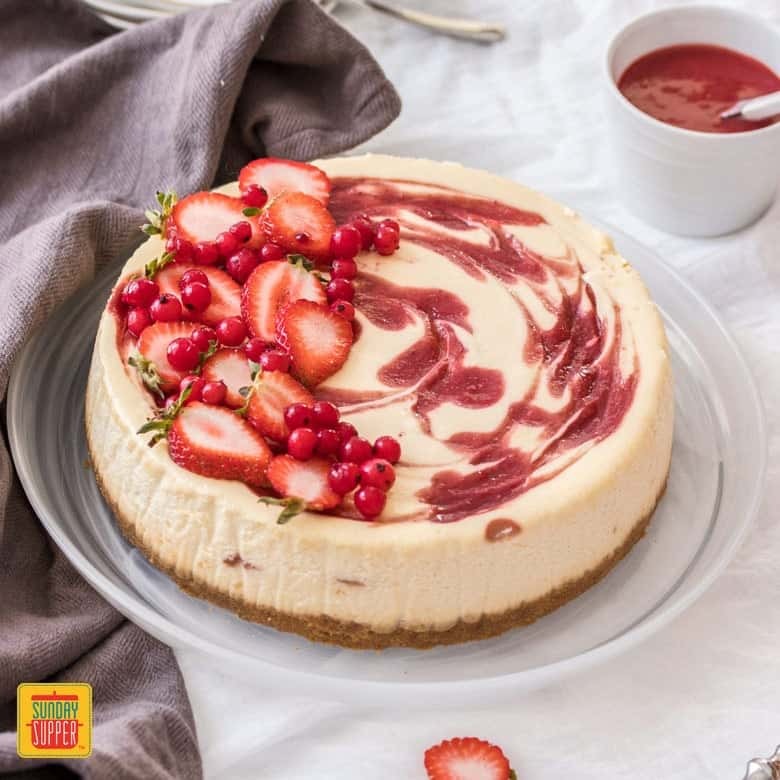 Let us know how you like this strawberry swirl cheesecake in the comments below! Preheat the oven to 160°C / 325°F / 140°C fan forced. 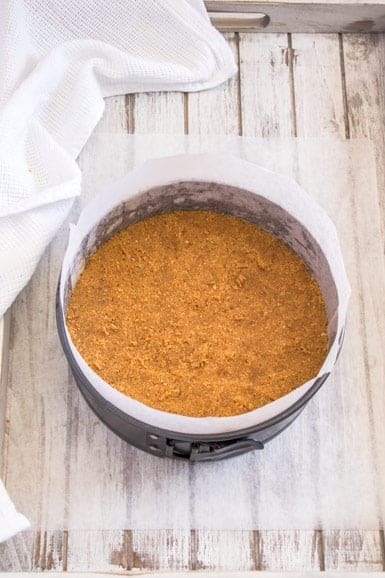 Grease and line the base and sides of an 8-inch round springform tin with baking paper. Bake for 10 minutes then set aside while you make the filling. Add the eggs and extra yolk, one at a time beating until each is well incorporated. Add the sour cream, salt, lemon juice, and zest and beat well. The mixture should now be looking completely smooth and glossy. Pour half of the cheesecake mixture over the base. With a teaspoon, dollop about half the strawberry sauce in small blobs, over the top. Carefully spoon over the remaining cheesecake mixture. Smooth out the top just a little, then again use a teaspoon to dollop over the remaining strawberry sauce. Drag a knife through the little strawberry patches to give it a swirl effect. Remove it from the oven and let it cool at least a further 45 minutes at room temperature before covering (a plate over the top of the tin is fine) and placing in the fridge to set completely. Let it set for at least 4 hours. This is such a beautiful cheesecake! I love the swirl – what a lovely touch.